The 600 pound deadlift. It is a milestone that I chased and wanted for quite a long time. Flash back to early 2009, my final year of college. I had just competed about 5 times in 8 months and was determined to pull a 600lb deadlift. 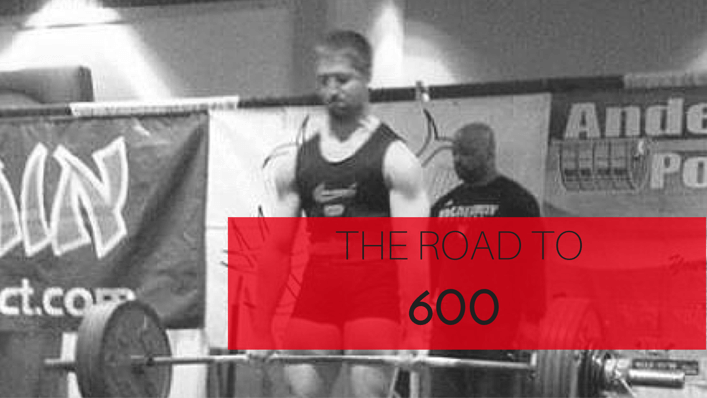 I had pulled 560 and missed 570 on multiple occasions in the 181 lb weight class. I was determined to get to this mark and trained hard and heavy too long without enough time for rest and without stepping back to truly figure out what needed to be done to get there. It was discovered that I had some rotation in my hips (as many do) and one glute wasn’t working as well as the other, among other things. I strained my left quadratus lumborum one day when I was front squatting, took a couple of weeks off/easy and then came back at it again. I ended up restraining things multiple times and while it was frustrating at the time, it ended up being a huge blessing in disguise. I wrote about the initial experience with this in a 3 part series here awhile back. The injury forced me to take a step back and see what was going on. Long story short, I ended up going almost 3 years without deadlifting or squatting heavy. I had to take time to fix my hips, iron out my mechanics, let my tissue heal and bring up weak points. I did lots of single leg work, plenty of glute and oblique work and lighter technique work for my bilateral lifts. You can check out my past article series just mentioned for more details on this. What I would like to discuss in this article is what I did and learned with my training after this “recovery” point on the final road to eclipsing the 600 mark. While there are many things that I did and that I learned that helped me to pull a 601 deadlift at a bodyweight of 186 and a 605 deadlift weighing a few pounds more, here are some of the big ones. While I initially had to gradually groove my way back into regular deadlifting (I would usually pull semi heavy once a week for 3 to 4 weeks and then deload for around 3 weeks with a less taxing exercise such as a pull through), once I was confidently and consistently feeling good, I realized that pulling with more frequency was necessary, sometimes twice a week and sometimes with extra deadlift specific assistance/variations on a third day. In the past, my deadlift often increased when I focused on bringing my squat up. While squat work definitely still helps, I discovered that I needed to focus on pulling more often, especially since I hadn’t done it in quite awhile. So how did I do this? Saturdays would usually be my heavy/max strength deadlift day. I would rotate between cycles of regular full deadlifts, band deadlifts and block deadlifts. The band and block pulls were huge keys for me and I will discuss more about them in a little while. While the specifics varied depending on what cycle I was in, where I was in relation to a meet, etc., I spent a lot of time building on heavy sets of 5, only occasionally working down to heavy triples and doubles. I actually stayed away from pulling max singles, contrary to my pre-injury training. As an example, I might build up with heavy 5’s for 3 weeks (usually leaving a couple reps in the tank) and then hit a PR double or triple in week 4 or 5, rotating between the 3 aforementioned variations just mentioned each cycle. Building the volume up with plenty of sets that were below max effort in intensity worked very well. As a deadlift specific assistance exercise, I often did paused band deadlifts. When I miss a deadlift, it has almost always been just above mid shin, below the knees. With my pause deads, I would put on about 200lbs of band tension in addition to straight weight, pull to my sticking point and hold the bar there for a 2 to 3 count, and then explode to lockout really focusing on driving my glutes through. I would do these for a few sets of 5 to 8 reps following my main deadlift exercise. More on these later. I would then follow this up with a squat exercise for reps, usually either front or back squats either paused , normal or one and a quarter style. This would then be followed by plenty of assistance work for glutes, quads, hamstrings, abs and back. Wednesday would then be my heavier squat focused day with a deadlift variation done for either reps or speed, often rotating between block deads and RDLs. I treated the squat similar to the Saturday deadlift workout, working with 5’s most of the time on either front or back squats. I would then follow this up with either block deads or RDL’s for sets of 8 to 10, usually in a lighter weight range focusing on bar speed and explosiveness (I might hit 315 to 405 for sets of 8-10 speed reps). I feel that this specific work helped me blow past the sticking point nicely. At other times, I would do regular speed sets, hitting 6 to 10 doubles or singles. Here is an example of a Saturday and Wednesday workout straight out of my training log leading into that meet I pulled 601 at. I happened to be hitting mostly triples on main lifts this week. I had worked fives the previous weeks. This was in mid-February 2014. Monday and Thursday were upper body focused days. On top of this, on weeks I was feeling good I would add in dimel deadlifts (sets of 20 fast reps from below the knee and back to lockout) for 2 sets of 20 and/or iso deadlifts against pins right at my sticking point, putting either 135 or 185 on the bar and pulling into the pins for 3 to 5 seconds for 2-3 sets of 4 to 5 reps. This would be done at the end of an upper body workout on Monday or Thursday. This particular week, I actually did single leg squat work on Monday after my upper body work. If you look at the deadlift work done in a week, I was getting some kind of specific stimulus at least twice a week and sometimes 3. Obviously its not always crazy intense or heavy but the neurological stimulus you get even from doing something like lighter iso pulls or dimel deads goes a long way with increasing the full deadlift. Overall, as my frequency increased, my deadlift improved. Building the volume up along with the frequency pays dividends. While working in really high intensity ranges is important at times, building through volume and frequency while leaving some in the tank is absolute money. As you can see, I have quite a bit of volume and a lot of assistance work. My training has pretty much always been a hybrid blend of powerlifting, bodybuilding and performance. I’ve built up my work capacity over many years to be able to handle the workload. Something to note here is that I also worked to put on some size during this time so my overall volume as well as calorie intake were upped during this time period. I should also note that I usually do some PRI style breathing drills post workout to help calm my system and my back extensors down. While exercises such as glute ham raises, reverse hypers and back extensions are great, I do a lot of these and I push them heavy (more on this in a bit), deadlift specific exercises have the best carryover. When I say this I mean exercises like the pause deads, the dimel deads, the iso pulls, rdls, block pulls, etc. that I mentioned earlier. I figured out that rather than going straight to ghr’s after my heavy key deadlift exercise of the day, hitting some reps of pause deads really helped. Hitting extra reps of rdl’s or block deads on my other day really helped. Thinking of assistance work in this manner provides significant extra lift specific stimulus, packs on muscle and can really help you blast through a plateau or sticking point. The key is figuring out which exercise you need for your own specific weaknesses. For me, I was friggin tired of missing lifts below my knees, so hitting pause deads against a mean amount of band tension helped me destroy that damn sticking point with nothing left over for evidence. A nice side effect of band deads, whether paused or regular, is that they get you amped up and ready to fly! So……When you do back extensions at either 45 degrees or horizontal, do them with a bar and hang onto it like you would a deadlift. Don’t be afraid to push them heavy (provided your form is on point). When you do glute ham raises, push them hard. I often hang onto an 80 to 100lb dumbbell and/or add band tension to bring them up. You need strong hamstrings if you want to deadlift a house. Perform some rows in a bent over/rdl type position and also try to use a grip similar to your deadlift grip (narrower). Barbell rows off the floor or off the rack, chest supported rows and bent over pulldown rows are some of my faves for good carryover. One thing I did that I hadn’t done in the past was throwing in rows on my lower body/deadlift days so that I could push them without worrying about my low back being sore when doing them the day after squatting or pulling heavy, and since they provide assistance to the deadlift and the squat. With abdominal work, the same principle applies. Suitcase deadlifts, suitcase holds w/ breaths, deadlift cable holds and standing abs are some of my favorites here. Train the abs hard and heavy and in similar biomechanical positions to your pull and you will see some nice carryover. Obliques are key. These are probably my number one deadlift exercise. As a main exercise, I will train them with no pause and build up my 5’s and then work to heavy triples and doubles in the last couple of weeks of a cycle. I believe that bands are great with deadlifts for a few reasons. They teach you to grind/strain all the way through a lift and develop good acceleration. The deadlift is a lift that requires the ability to grind all the way to the top. If you get stronger while pulling against significant band tension, you will smoke straight weights. Don’t get me wrong, you absolutely must spend ample time training with plain old straight weight as well but these can definitely give you a good boost if you are at a point in your training career that you need them. Beginners need not apply as it can just make things more complicated for you. They will make you stronger out of the bottom and at mid range. First, if you set the bands up correctly, there will be a decent amount of tension in the bottom. Second, you need to develop a great amount of force off the floor in order to be able to “beat” the tension as it builds during elevation of the lift. Then, obviously as the tension builds at that sticking point, you have no choice but to grind through it to lockout so when you go back to straight weight, your body is ready to blow past that point. With the pause deadlift, you basically train your body to grind through your sticking point, which for me was around mid shin. The neurological drive you will send to your muscular firing and coordination at that specific range of motion is a surefire way to train your body to blow past this point. It is essentially an isometric exercise in the middle of a full range deadlift. With isometric training, you will generally gain strength up to 3 inches above or below the point of the ROM that you are training. Throw in the band tension and these will make you a monster. I give paused band deadlifts more credit than anything for my progress. Another great exercise that can help is block deadlifts. I give thanks to Dan Zwirlein and Dan Pasholk for recommending these to me. Since the weights rest on the blocks instead of the bar resting on pins, it more closely resembles the feel and position of this point of the range of motion of a regular deadlift (pulling off of the rack is a little different). In general, these will be harder when pulling from a sticking point than when pulling from the floor since you have NO momentum to get you past it. When done correctly, if you PR from blocks at a point that is hard for you, it should carry over to improvement with your full pull. Note: you should mimic the same hip position that you would be in at this point of the range of motion if you were doing a full deadlift. As I said earlier, these and band deads were the two key exercises I used in my heavy rotations (along with regular deadlifts). In the past, I was a big fan of box squats for helping to build starting strength and good hip/leg drive. While I still do like box squats at certain times, I have a love affair with pause squats, both front and back, for a few reasons. They require you to stay very tight throughout your core in order to maintain your position and then drive back up. In my opinion even more so than box squats do since there is no platform to sit to. I feel that the positioning and movement build hip drive that carries over very well to the deadlift, especially conventional since I do these squats with a moderate to narrower stance. Sets of 5 to 8 reps work well here as an assistance exercise after your main squat or pull. They can also stand on their own just fine. I love pause squat variations for beginners as well (especially stubborn high school athletes that try to cheat everything) as they teach you to feel where you are at in the bottom (hips, back, knees, etc.) and build very good stability in the bottom while not allowing you to use too much weight or weight that you can’t handle. Sit back until you get as low as your mobility and body structure allows you to safely do, pause for a 2 to 3 count and then explode up like a rocket ship. You might love them half as much as I do. As I mentioned earlier and in my past article on exercisesforinjuries.com, pushing single leg exercises up was a key component of ironing some imbalances out while still building some muscle and strength. While I don’t focus on hitting these heavy all of the time like I was during my rehab stages, I still make them a priority each week. If all you do is bilateral work, you are bound to develop some kind of imbalance side to side and you also leave out development of stabilizing musculature. Using the example training split that I mentioned earlier, I would incorporate a unilateral squat exercise on Wednesday after my bilateral squat work and a unilateral hip hinge on Saturday after my deadlift work. There was even a phase where I did heavier single leg squat work on Monday after my upper body work so that I could put more into it rather than waiting until I was fatigued from the squat and dead work on Wednesday (this is how it was the week of the workouts I posted earlier). Front Reverse Lunges, Bulgarian Split Squats, Step Ups and One Leg Supported Squats were/are my favorites for unilateral squats and One leg rdl’s with barbell in front, kb’s or suitcase style are my faves for single leg hip hinge. I also utilize one leg hip thrusts, one leg reverse hypers, one leg back extensions and one leg glute ham raises. Bottom line is, performing single leg work and pushing it hard at times will help keep you healthy, help build muscle that you won’t tap into with bilateral work and most importantly for the purposes of this article will help you improve your deadlift. Remember, we want both of our glutes and hamstrings firing us through to lockout like a rocket ship, not just one. Going to the opposite end of the spectrum of deadlift frequency, we have the lovely deload. If all we do is deadlift all of the time, there is going to come a time when we experience some burnout, neurologically and anatomically. One way to deload is to simply lighten the weights up significantly while still training the motion. However, for me, I have better success with ditching the barbell altogether and doing high reps of exercises like pull throughs, back extensions, reverse hypers, etc. This allows me to recover and rejuvenate both my nervous system as well as my joints, muscles, etc. When I come back to pulling deads, I usually feel amazing and ready to lift houses again. While these days I usually like to stick with a small number of variations to progress well, if I feel like I am still stalling or feel off even after a deload, I will do a 3 to 4 week cycle of heavy good mornings or sumo deadlifts. The good mornings will help build the deadlift nicely with a similar hip hinge pattern albeit with a different stress on the CNS, which can help cause new adaptation; while sumo deads will help build the hip drive with the conventional pull and also create a nice new adaptation. After this, I can pretty much guarantee that I will be ready to go back and crush regular deads again. Bottom line is: after a few cycles of intense pulling, you can do your body and mind a favor by taking a few weeks to deload, rejuvenate, supercompensate and prepare to come back better than ever. And don’t worry, you can maintain residuals of max strength for 4 to 6 weeks after stopping (according to Issurin’s work in Block Periodization) so you won’t lose anything during your time off. While there are many things that I did along the way to hitting the 600 mark and I could write pages on end about it, I feel that these are some of the keys that got me there. I’ve played around with more training modalities and variables over the years than you can imagine and I’d like to think I’ve learned a thing or two along the way. These are some principles that anyone with a decent amount of training experience can apply and make some improvement with. Rather than deadlifting once in awhile, do it more often and improve it. Remember, this doesn’t have to be a balls out max effort thrashing. Leave some in the tank and build up your volume. Try some block deads and band deads if you have a sticking point somewhere. Build your leg drive with some pause squats. And finally, keep yourself healthy and on the climb by deloading when appropriate. As I mentioned briefly, I also put on some extra size during this period. After competing at 181 for most of my competitive career (and lingering around 184-185 on an average day), I got up to about 190 (a lean 190) and competed at 186 for the meet I pulled 601 at. I feel that this helped a little with my strength levels. There comes a time when you need to put on a little extra size to keep getting stronger, especially when you get to a certain level. Finally, learn how to breathe appropriately. Better inhalation with better expansion around your entire trunk will give you better stability to pull with and doing some breathing work post workout and during recovery periods can help with recovery by getting you out of the sympathetic mode you were undoubtedly in during your thrashing session. Now go pull something heavy! Bonus: Here is what my current training week looks like in 2015. I’d like to hit 650 this year and hit 700 weighing under 200 eventually. Sunday– Conditioning- usually a circuit involving jiu jitsu and boxing work, farmers carries, med ball, kettlebell work, agility drills, etc. I’ll usually hit calf/lower leg work multiple days a week either before or after these workouts and I’ll also add in some light sled dragging and reverse hypers on some of the upper body days to help improve recovery in my legs and build up work capacity. Lighter accessories like grip work and neck work are thrown in here and there when needed. There will be certain phases where I will do olympic lifts, jumps or explosive exercises before squats or deads. There will be different cycles I’ll do where my training changes from what you see here but this is currently a decent general overview. I perform soft tissue, breathing and mobility work during my warmups and sometimes for recovery. Overall, my training is a hybrid combination of powerlifting, bodybuilding and performance training and I’ve been going at it for over 15 years now with no plans of stopping. It’s a part of me. This probably looks like a lot and it is, but I’ve been training since my early teens and I’m 29 now, so that’s a lot of years building up my work capacity and body to be able to handle what I do. Nick Rosencutter, founder and owner of Rosencutter Ultra Fitness & Performance in Milwaukee, is a strength and conditioning coach, manual therapist, competitive power lifter, martial artist and writer. 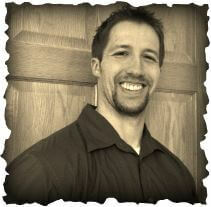 He is a Certified Strength and Conditioning Specialist and Certified Personal Trainer through the National Strength and Conditioning Association and a Licensed Massage Therapist and Full Body Active Release Techniques provider. Since graduating with a degree in Exercise and Sports Science and Strength and Conditioning from the University of Wisconsin La Crosse, he has worked with hundreds of clients, ranging from elite and youth athletes to people who want to shed fat and improve their bodies. He heads up strength and conditioning at Greendale High School, works with the ASE Speed Skating program at the Pettit Olympic Training Center and performs ART manual therapy services at Emerson Climate Control and SC Johnson in the Milwaukee area. His blend of experience with both therapeutic and performance modalities along with his years of personal in the trenches experience give him a unique hybrid like viewpoint on the body and its performance. Thanks for the tips! I’ve been working on increasing my frequency as well. I’ve only hit a 405 during training(only once), and really have no plans on competing. However, I would like to hit 600 as a goal (~5 years?). In the past I worked up to a few heavy singles once/week and left it at that. Strength would increase, but I just didn’t feel comfortable. I came across some free tires on rims, made some adapters, and now have about 255# of “bumpers” to work with at home a few light days per week. We’ll see how it pays off, but the high reps seem to be helping my form. It was well worth the investment of $0.